Many different forms of organization were necessary for the Landless Workers’ Movement (Movimento dos Trabalhadores Rurais Sem Terra – MST) to successfully promote the 3rd National Agrarian Reform Fair in São Paulo, Brazil. One of these forms was through cooperation. From North to South and East to West in Brazil, many different experiences have resulted in a diversity of healthy produce and food products, which visitors can buy at the food fair that is taking place until next Sunday (6). One of these experiences happened in the city of Piratini, Rio Grande do Sul state. The Association of Ecologic Farmers Conquest of Freedom (Associação de Produtores Ecológicos Conquista da Liberdade – APECOL) produces around 50 black and pinto bean seed varieties. It’s a relatively new initiative – it has been introduced only three years ago –, yet it’s already one of the main references for the MST in terms of diversified organic bean seed production. Marli de Oliveira, 47, a resident of the settlement, is taking part in the National Agrarian Reform Fair and says that cooperation was crucial for the APECOL to be able to bring 15 seed varieties for the first time to Brazil’s largest event in terms of food diversity in such a short amount of time. “This is worth our union for the association, because it allows us to sell what we grow and have the prospect of a more decent life in the countryside. If it weren’t for it, we would probably not be here today. The work of our 22 families is appreciated here. This is a place for us to feel acknowledged, because usually a lot of people bad-mouth the landless workers, but they don’t know what they are talking about,” she says. 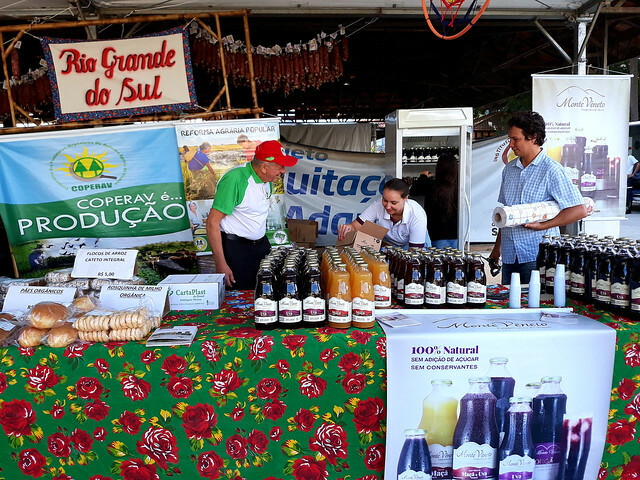 The Cooperative of Southern Minas Peasants (Cooperativa dos Camponeses Sul Mineiros – Camponesa) is also selling their products at the National Agrarian Reform Fair. The co-op was established in 2012 as a tool for landless families to organize, and it is located in the city of Campo do Meio, Minas Gerais state. Some of their main products available at the fair include their coffee brand Guaií, the co-op’s flagship product. They currently produce 4,000 coffee bags a year and estimate their production can grow to 15,000 bags in the next crop. “Our idea is to produce as much organic coffee as possible,” says Roberto Carlos do Nascimento, 46, a resident of the settlement. In addition to coffee, the Minas Gerais stand also sells other Camponesa products, such as pickled pepper, rapadura (unrefined dehydrated whole cane sugar), corn flour, goiabada (guava paste), tomato sauce, and doce de leite (milk caramel spread). They are produced in three recognized settlements and 11 camps on contested property. At the fair, around 500 families living in settlements and small local producers are selling honey, brown sugar, seeds, medicinal herbs, and jams. Most stands that are dedicated to selling produce and food products are certified as organic, while others, especially the ones grown in camps, are transitioning to agroecological systems. According to Nascimento, cooperatives are a way to strengthen the cooperation process between families and improve the production, industrialization, and marketing of their products. Like Oliveira, Nascimento argues that this cooperation-oriented work makes it possible to take bigger steps towards a new model of society. “It’s clear how important it is to have a tool to support us so we can become stronger and stronger. This is why cooperatives are crucial,” he adds. Another experience at the fair comes from Sergipe state, where an initiative in the Caraíbas Settlement changed the lives of 26 women. It’s the Mixed Cooperative of Family Farmers of the Caraíbas Sweet Home Settlement (Cooperativa Mista dos Agricultores Familiares do Assentamento Caraíbas Doce Lar – COOMAFAC), in the city of Japaratuba. The peasants who live in this settlement make more than 20 types of food products, including cakes, biscuits, queijadas (a type of cheesecake), and pão de queijo (Brazilian cheese bread). According to Eliene dos Santos, 44, the organization of women toward agro-industry and the cooperative started as a way to value the cassava they grown on their plots in the agrarian reform settlement. Santos says that the most dramatic change brought about in the lives of these women seven years after they started the cooperative was in their livelihood. “[Before the cooperative] We had no income, no access to Bolsa Família [Brazil’s most important conditional cash transfer program]. We literally depended on our husbands to support us. But now we are financially independent, we can buy things because we know we can afford them. This initiative changed our lives completely, because now we can say: ‘I have my own things, I don’t depend on my husband for money.’ Now we can buy things for our children and furniture for our home, and we are proud to know our contribution in this sense,” she says.